I am ashamed. I have let myself and all the readers of Bikes And Travels down. 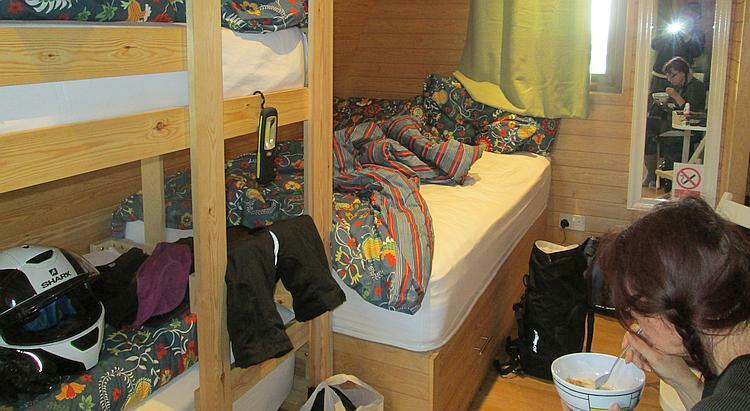 In the interest of open and honest reporting I have to admit sleeping in the pod last night was a welcome joy. The bed was comfortable, the pod was warm and being comfortable and warm always makes Sharon feel a little more, erm, well, frisky. Last night's weather was wet and a little windy, nothing to worry about really though. Today - well the whole reason for hiring a pod is because today is going to be a total washout. There's going to be wind and rain and a storm and doom and despondency. Not to worry because we'll be warm and safe and dry in our pod. Even if we do venture out to explore it will be nice to have somewhere to dry out and recover. We've made the lovely pod untidy as usual. On this cold and wet morning I have received an email. Damn! The main system I look after at work is playing silly buggers. Cursing and grumbling I take my tablet and my rain coat across to the bar come cafe come restaurant as the internet connection there is hopefully sufficient for remote access. Luckily it is. Luckily I can remote in via my tablet. Luckily I have backups. There's no-one more surprised than myself when I get things up and running again using a £60 tablet and WiFi internet access. Luck, not skill, just luck. Sharon's getting dressed and this terrible awful weather means it's stopped raining. In spite of last night's comforts I tease Sharon, suggesting that unless this big dangerous godawful weather arrives she's in DEEP trouble. She doesn't care at all, she has slept in a big soft bed and is getting dressed in a warm dry room while drinking hot tea. It wasn't her money she spent. Pffffft. So again let me get this straight. The last 2 times we've been exploring she's chosen to come pillion, fine, I'm happy with that. Yesterday she got soaking wet and was forced to do countless u-turns on narrow muddy lanes due to my lack of navigational skills. Today there may be a storm-a-coming and I'm likely to get lost as ever I always do. But today she wants to ride her own bike. God has watched Steve the hairy biker these last 55 years. He is a good man, in fact he's the most honest, kind hearted, generous, loving and charitable soul God has observed in 2,000 years. In a remarkable turnaround God decides that he will grant Steve a gift in his mortal life rather than waiting for him to reach the afterlife. God appears before Steve, much to Steve's surprise. "Choose a gift!" states God. "I wish for world peace, I wish for an end to suffering and...."
"No, the gift must be for you, for once in your life I command you to be selfish." Steve ponders, stroking his thick hairy beard. "You know I love to ride. You know I've always wanted to ride across America. You know I'm scared of flying. I'd like a bridge from here in the UK to America, I'd like to ride all the way across the Atlantic Ocean to America." God says "Steve! Imagine the logistics, imagine the size of the columns, imagine the engineering, imagine the thickness of the cable, think about the amount of concrete required, what about service stations then there's the weather! I'd have to re-write some of the laws of physics. Is there nothing else?" "There is one other thing Lord"
"I'd, I'd like to understand women." "So how many lanes do you want on this bridge?" I guess you'll have to make do with the Millau Bridge for the purposes of illustration. So Sharon wants to ride through this storm huh? This storm that has caused the clouds to clear a little. This storm that is bringing the sun out. This storm that's caused me to spend more than I'd budgeted for a warm dry pod. Yeah, that storm. Sure enough within 20 minutes of departure I lead us down a dead end track that may or may not reach a beach. If it does then we're not going to find out as Sharon's Kwakker isn't really an off roader and Sharon's not ready for gnarly farm tracks just yet. I park my bike up and I stand beside Sharon as she works to turn around on the stones and the dirt and the grit and the mud. I could, and it would be easier to just tell her to get off and spin the diminutive 250 around for her. But that won't help if I'm not here to help one day. I'm here if it goes wrong, I'll catch her and the bike as best I can if it does. She can ride the open roads very well these days, she's still a shortarse and still a learner with this kind of stuff. On top of a high bluff Rhossili beach is below us as we turn around easily on this car park. 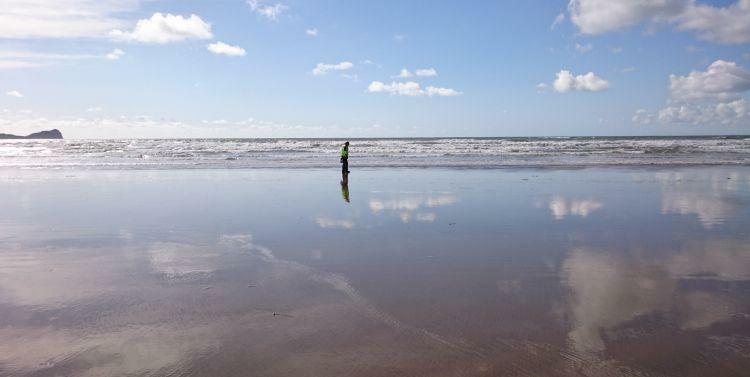 It's a big beach, another of South Wales's endless wonderful beaches. As we look down Sharon says to me "See the people down there?" No, eh, what? WHAT?! 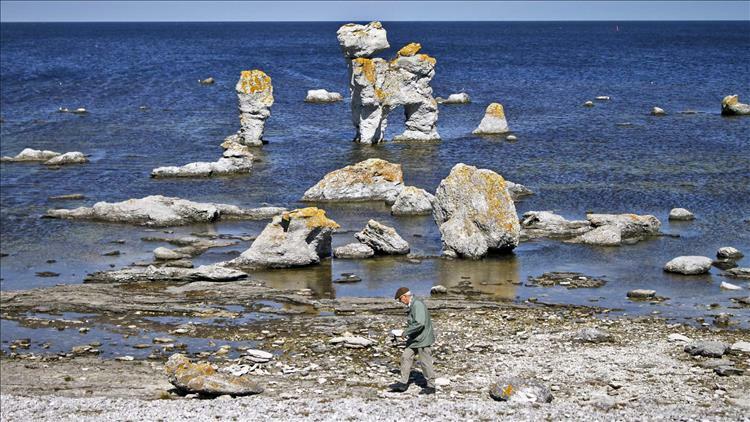 Those small specks on the shoreline are not twigs or driftwood, they're people. This beach isn't big it is absolutely ridiculously massive. I had no sense of the size until I saw people to bring it into perspective. Getting to the big beach is another thing. We ride inland and around and out until we reach Hillend Camping Park. Here we find a place to park and start the hike to the beach. It's like a scene from Beau Geste as we climb the dunes until we finally reach the flat sands. 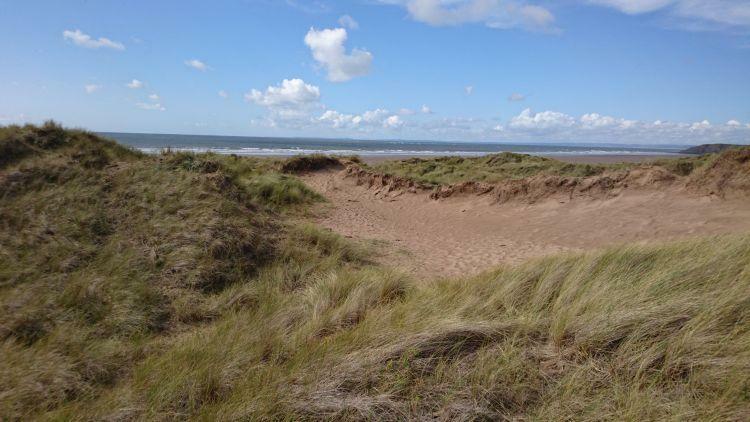 It then takes another 10 minutes to walk from the dunes to the water's edge. It's big. WATER...WATER! Sharon is struggling onwards to the beach. It is blooming huge I tell ya. I'll let Sharon tell you what I get up to at the water's edge. Somewhat breathless we eventually return to the bikes. Back on the road I lead us rather aimlessly across the peninsula via the narrow lanes. It's not uncommon to find sheep at the roadside in the remote areas of the UK, here we're finding cattle and horses across our path too. This causes us no problems as our speed is minimal it just leaves us perplexed, what is different? By random chance I end up on the road to "Three Cliffs Bay". After getting stuck in yet another steep dead end road and another u-turn we park at Three Cliffs Bay Holiday Park because they serve tea. We offer our possibly unwanted opinions regarding camping facilities for bikers and cyclists as we sip on overpriced tea. Leaving the bikes on the car park we set off to walk down to the beach. The steep road leads to a path. The steep path leads us down to yet another lovely beach and cove. I'm happy with our surroundings, Sharon is highly impressed. I guess it's because there's no-one here save for a couple of dog walkers in the distance, she's antisocial like that. Sharon wanders off taking artistic type pictures while I sit and wait. I have no idea what the devil she is doing. It'll be "art". The walk back up the steep path and the steep road turns into an endurance test. Sharon is - at times - fiercely competitive and I am curious as to whether or not I can complete this without stopping or passing out. A quarter of the way up I'm huffing and puffing. Halfway there I'm wondering if I am going to die. Sharon stays with me but she's suffering too. We're only walking. Three quarters and my heart is pounding, I am sweating and gasping for air. I am going to die. Stood next to the bikes you'd think I was 80 years old having just climbed Everest without oxygen and running the last half-mile. Wheezing, coughing and shaking, I look at Sharon. Luckily she's at least got the decency to pretend she's knackered. Am I unfit or is this what it's like to be 45? When we finally start to breathe normally and my legs stop wobbling we head back to the campsite and the pod. After a rest and a brew the day is still quite young, the sun is still shining and I'm at risk of getting bored. 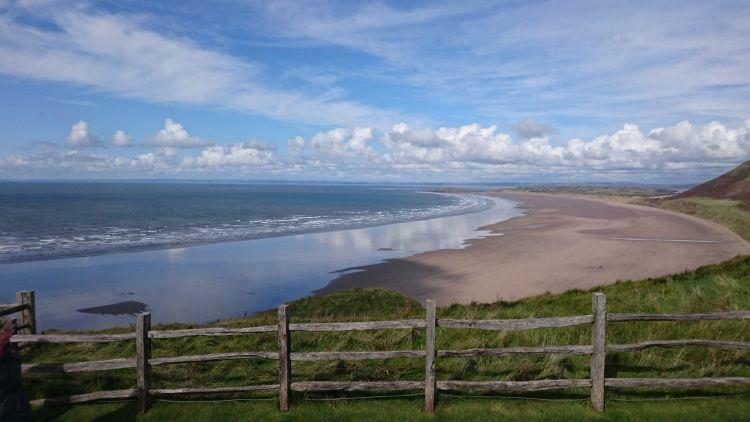 We hop back onto my motorcycle 2-up just to pop into Port Eynon and see what's there. Not a lot. In keeping with the theme of this trip so far there is of course a beach in a cove. There's a car park and a small selection of houses. Apparently there's a YHA hostel clearly signposted but not clearly visible. That's your lot! We detour via a potholed track which we bounce along. I stand on the pegs but being pillion Sharon can't, causing her to laugh maniacally as she's flung around in her seat. She's not right in the head I tell ya. Well what a day! It has not been a hot or even warm day but considering the forecast was doom laden it has been dry giving us an opportunity to explore the Gower peninsula. We sit once more in the bar sipping coke and surfing the interweb then retire for another night of comfort in the pod. I daresay I'm not looking forward to being back in the tent tomorrow night. Yeah, the storm today was terrible. I am feeling very refreshed after the comfortable and warm sleep last night. Therefore I am really up for the ride out today. The weather is far better than predicted. Haaa bloody weathermen. Oh well I am not going to pray for rain today, lets just enjoy the specks of blue sky beginning to appear. I enjoy the ride until we get to a dead end and I have to turn my bike around. Times like this I really do despair of my lack of height and strength. It is quite a cold day but I sweat a lot in my bike gear as I struggle to get the bike turned around. Ren tries to cheer me on by saying it is all good practice. Pfft. We pull into a car park and get off for a stretch and admire the huge expanse of sand that lies below us. This beach is vast but then I spy ants on the beach that I then realise are people. Wow it is even bigger than I first thought. I am still not my usual self on the bike. I have no idea why but there is no doubt I am more cautious and nervous than I have been in a while. I rode some really gnarly roads in Scotland yet today I wimp out at going down to a rough bit of car park near Rhossili beach. I choose instead to leave my bike at the cafe car park, I even dither about doing this because it is on a slope. Oh I despair, what the hell is wrong with me? I jump on the back of Ren's bike to ride to the beach car park. What a bloody wimp I am. Wimps such as I leave their bikes here with views of the extensive sand dunes. The trek across the sand dunes is no easy feat in one's heavy bike gear. Due to the storm prediction I have my thermals and winter pants on. Time to sweat again then. We finally reach the beach and stand for a while in awe at its titanic size and broad expanse of sand, 3 miles of it apparently. Talking of titanic Rhossili beach hosts its own ship wreck, the Helvetia. Not much remains of Helvetia today, well she has laid here since 1887 but you can still her carcass of ribs poking through the sands. 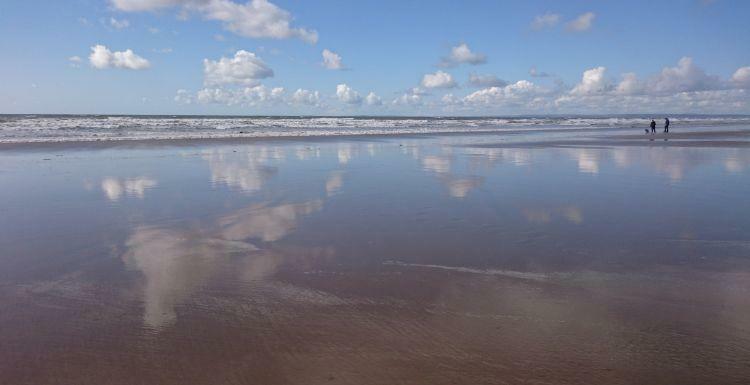 It takes a while to reach the sea but we are rewarded by the ethereal spectacle of the shallow waters at the sea edge reflecting the sky in a perfect mirror image. Ren loves the sea. I would like to think of him of a dashing pirate. He has the looks and the hair but I just can't see him raiding ships and engaging in hearty sword fights. I can imagine him hiding behind me while I end up being the one drawing swords. As he often states himself he is far too pretty for fighting. He also makes a very handsome surfer dude as well does Ren given the opportunity. My handsome surfer dude in Cornwall. There will be no surfing today. It is way too cold, there are no waves big enough and we can not fit a surf board onto the bikes. 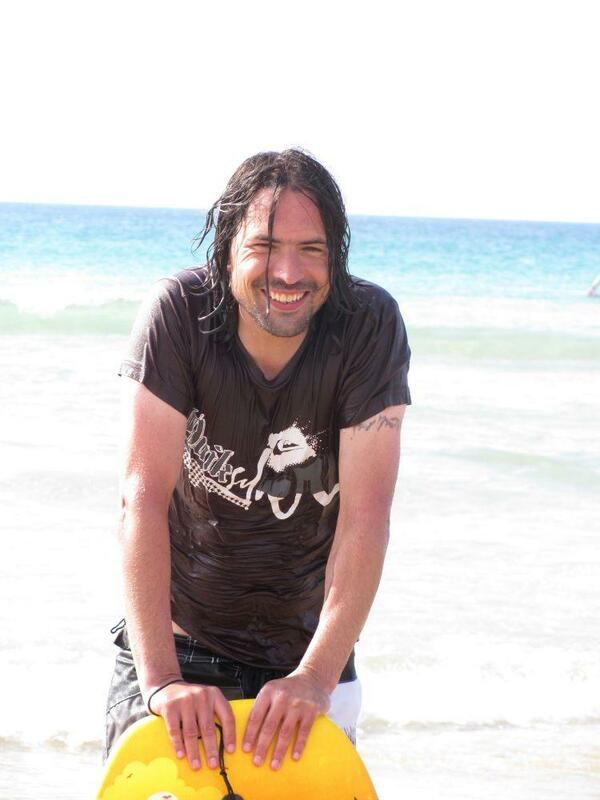 Therefore Ren has to content himself with a paddle in the sea. I myself am not a big fan of beaches...usually. However Rhossili is something special and even I like it. It appears I am not the only one as it has been voted Wales' Best Beach of 2017. I enjoy taking my time strolling along looking for that elusive perfect unbroken conch shell that I never do find. Back on the bikes and we find ourselves heading towards yet another beach. However we realise this one is only accessible via walking when the road we are riding down abruptly stops at a dead end. Ok so whats new, we are always finding dead ends. Trouble is this one is particularly difficult due to a severe slope with little room for manoeuvre. Damn it I am well and truly stuck. I can not move anymore forwards. I can not paddle the bike backwards as the slope is too steep. I cannot even get off the damn bike to try and push it because due to the camber of the track I can not even get the side stand down. Arghhh, trouble, trouble, trouble. One minute you are happily riding along in the sunshine and the next you are going nowhere. Nope not even an inch. Now if I had been on my own I may well have still been here. Going down with my bike rather than a ship. However luckily for me Ren my hero is with me and comes to my rescue...again. He might not be a sword fighter but he is great at rescuing damsels in distress. Between us I get my bike turned around and I can escape. I am left somewhat perturbed by the fact that this was just another example of the kind of trouble I can get into if I went adventuring solo. On known rides and main routes I am fine riding solo but would I dare ever go poke my nose and front wheel down some possible dead end track on my own? No probably not. Ahh well just as well I like company on my rides then. By chance we find a campsite with a tea room and suitable car park just a few yards away. We enjoy a nice brew while having a chat to the owners of the campsite. 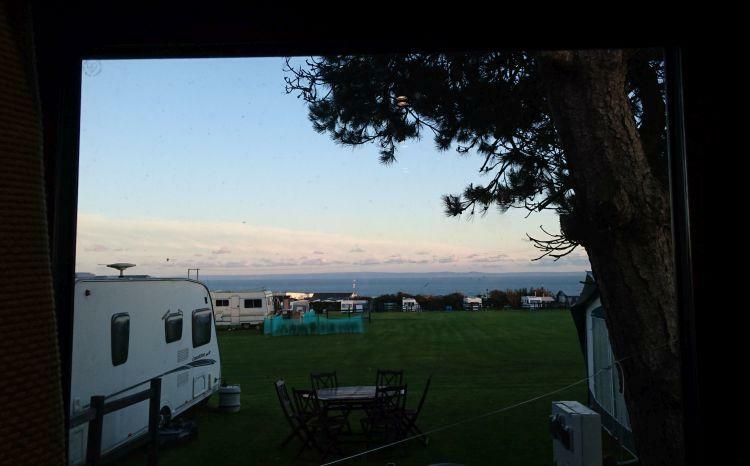 They are very excited by the fact that their award winning campsite has just been awarded the coveted 5 stars. They give us one of their brochures. 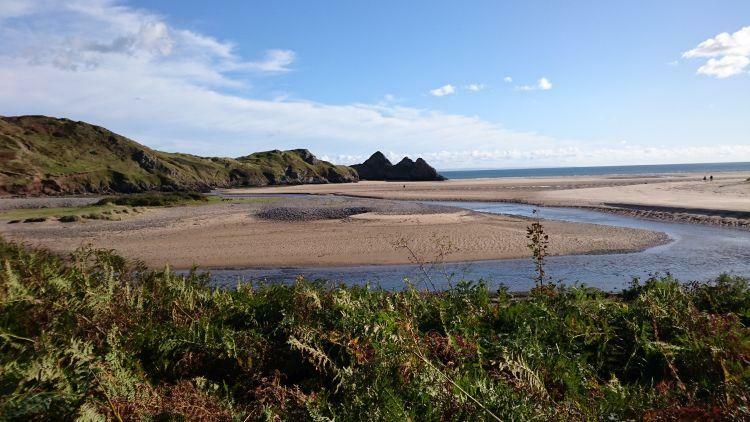 Three Cliffs Bay Holiday Park is a luxury campsite. 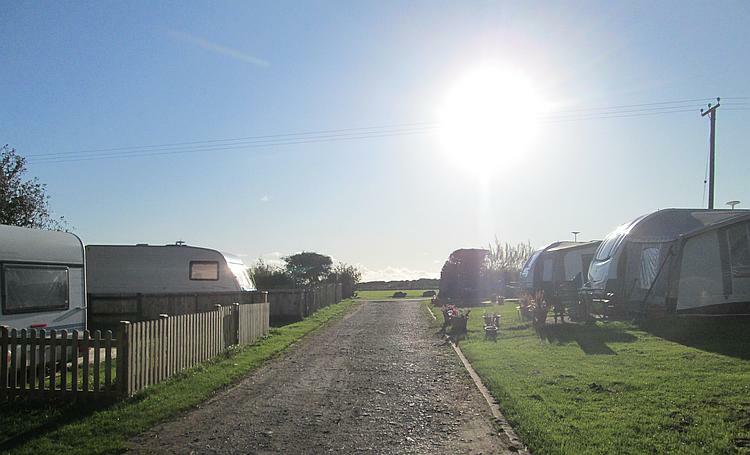 As well as tent and touring pitches they offer Glamping and holiday cottages. It really is all rather lovely but such luxury comes at a price. Lets just say our pod suddenly seems rather a bargain. To glamp here would cost 3 times as much per night. If I had the money then yes I would stay here but I don't. Therefore I just sip their tea while replying to the owners questions about anything that we think they could offer that would improve their site or make life better for campers such as ourselves. It is great to see such passion and enthusiasm for a campsite from its owners and I wish them every success. They kindly let us leave our bikes in their car park while we take the stroll by foot to Three Cliffs Bay. WOW! Ok here we go again, another totally fabulous and stunning beach is laid out below us. Yes I have been impressed by all the beaches and coves we have discovered so far on this trip but this one, this one just blows me away. A river winds its way through the beach to the open ocean, merging fresh water with the salty sea. It also divides the golden sands from the pebble beach next to the cliffs creating two contrasting beaches side by side. Sands dunes give way to salty marshes adding to the diversity this one bay has to offer. It is also practically deserted save for a couple walking their dog. I think I have just found my favourite UK beach. 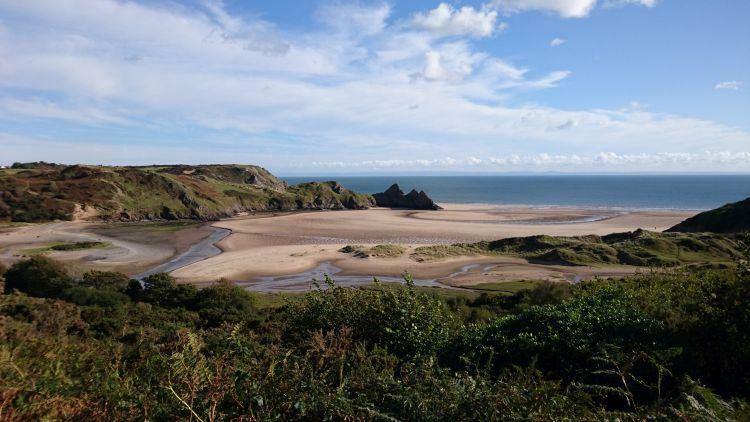 Three Cliffs Bay, what a gem. The signature three limestone cliffs, hence the name. Once we have descended to the bay we cross over the river via the stepping stones and explore. This bay has a somewhat wild and remote feel to it and I guess that is why I love it so much. Oh that and the fact is is practically deserted as well of course. I learn later that you are advised not to swim or engage in any water sports here due to strong tides and currents at all times. I guess this coupled with its rather inaccessible location is the reason why this particularly beautiful bay is left in relative peace. Imagine the hours of fun you would have had playing here as a child. They say what goes up must come down. Well unfortunately for us right now the reverse is true, what came down (us) now has to go back up. The climb back up out of the bay is somewhat challenging. Especially as it soon becomes apparent to me that sadly Ren does not seem to have any intention of stopping for a rest on the way up. As for me I would be all for just pretending to stop to admire the view one last time, but no Ren is plodding on ever upwards. Damn it I am not about to be left behind looking all weak and feeble. This reminds me of a trip we had many years ago to Cornwall where like here there was a steep climb from the beach. There like now neither of us wished to be beaten by the other. Without uttering a word to one another we somehow both know this is now a competition. Failure is not an option on either part. Despite the fact this is really beginning to burn I cannot, I must not stop. I try to remember my breathing techniques from my running days. Jeez when did I last run? Probably more than 10 years ago before my spinal tumour stopped all that. Ohhh I was so fit once upon a time but this is not a fairy tale and I am no longer fit and this hurts, it hurts a lot. We reach the top together, we both try to act like it was a breeze, that we don't really want to collapse in a heap on the floor. After rueful smiles we both admit we thought we might pass out. Stupid sods. We have a lovely ride back to our campsite and as the sun is still out we decide to make the most of it by going out again. This time just on Ren's bike to nearby Port Eynon. As the sun finally sets I happily reflect on our Glorious Gower experience in the warmth of our cosy pod, pure happiness. Watching the sun go down from our pod window. The end of a a memorable day. Ehhh, t-shirt, beach, surf,... guess these pics are from earlier this season, thanks for the look, nice nature, and very nice shots also, will see if I can read the article closer when I'm off duty, for a shot while I confused it with France, due to the bridge, here is a pic from Gotland this year. HA! Yes you need to read it more carefully. Another excellent picture Henrik - you have an eye for these things.